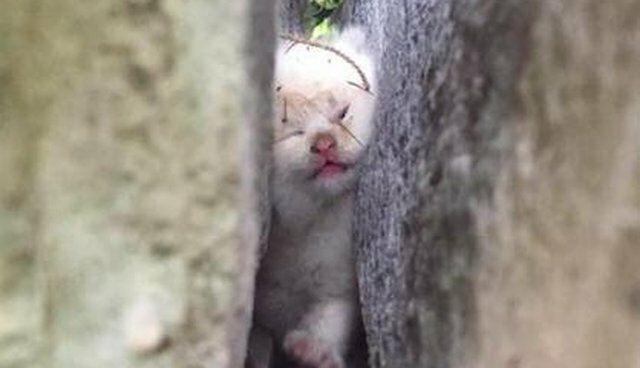 This tiny kitten almost didn't make it out alive after he got wedged between two stones - and stayed there for two days. A homeowner in Johnston, Rhode Island, discovered the little fluffball after hearing cries coming from behind his house. Animal control officer Erin Medeiros showed up to rescue the 2-week-old kitten, but found he was stuck too tightly for her to pick him up. "He fell where the back of the bricks were, you could tell it was a bigger of a gap," Medeiros told local outlet WPRI. "He probably fell down there, and being scared, he kind of tried to scurry his way out and ended up getting stuck." Medeiros had to call in the fire department for backup - but once the firefighters arrived they realized the kitten was seriously trapped. The officers were finally able to free him, but only after they pulled out the Jaws of Life, something Medeiros never had to use before. Rescuers finally squeezed the scared little kitten out of the crack where he was stuck, but he was skinny, dehydrated and covered with fleas. The tiny kitten, who's now going by the name Stunner, was rushed straight to an emergency foster home, where he got a bath and a warm bed. Afterward, he almost looked like a completely different animal - clean, fluffy and happy. The best part is, he already has a family ready to adopt him. "Just want to let everyone know I have a great home lined up. [Thank you] for all the wonderful amazing comments," Medeiros posted on Facebook. It was Stunner's curiosity that got him into trouble in the first place - but hopefully his scary two-day ordeal won't curb his brave personality. Soon he'll be in his forever home, where he'll be free to (safely) explore without worry.